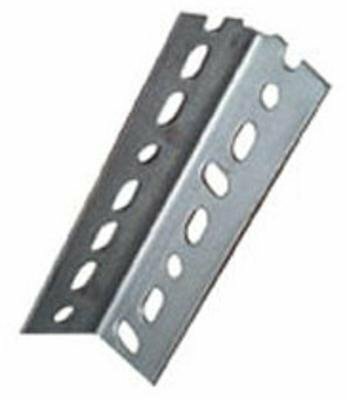 The Forney 49645 slotted angle plated steel, 14 gauge 1-1/2-inch(38.1 mm)-by-1-1/2-inch(38.1 mm)-by-3-feet(.92 m) galvanized mild steel slotted angle. Forney industries is one of America's longest operating family-owned metal working product companies. Founded in 1932, Forney offers more than 5,000 products for the hardware, automotive, farm & ranch and do-it-yourself markets. For more information, visit www.Forneyind.Com. If you've got metal working questions, we've got answers. We're committed to your success regardless of location size or needs. Please contact our team at www.Customerserviceatforneyind.Com. 1-1/2-inch(38.1 mm)-by-1-1/2-inch(38.1 mm)-by-3-feet(.92 m) 14 gauge thickness (5/64"). claims for warranty must be made within 90 days of the date of purchase. Proof of purchase required. This warranty does not cover any product that has been subject to misuse, neglect, negligence or accident, or that has been used in any way contrary to the purpose intended. If you have any questions about this product by Forney, contact us by completing and submitting the form below. If you are looking for a specif part number, please include it with your message.